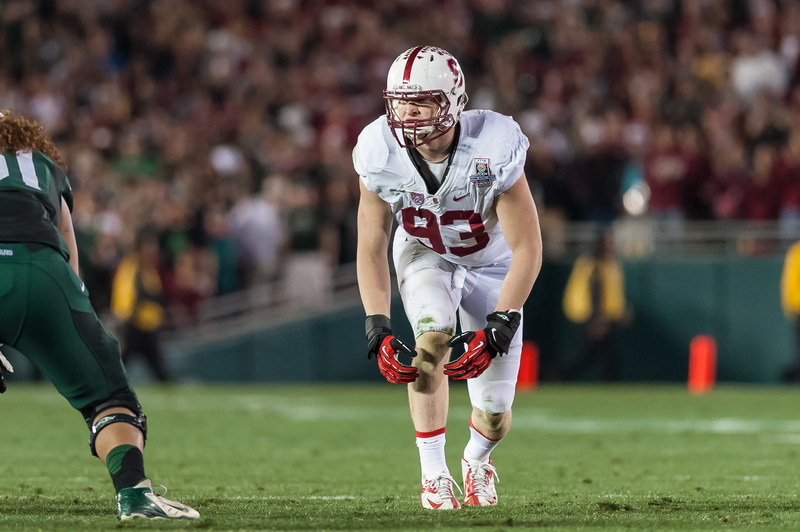 Adding to an ever-expanding presence in the NFL, four members of Stanford football’s 2014 class survived training camp cuts and made a 53-man roster, raising the total number of former Cardinal players in the league to 22. Rookies Trent Murphy (Washington), David Yankey (Minnesota), Cameron Fleming (New England) and Ryan Hewitt (Cincinnati) succeeded in earning a spot on an NFL roster, while fellow first-years Shayne Skov (San Francisco), Josh Mauro (Pittsburgh) and Ed Reynolds (Philadelphia) were cut but named to their respective teams’ 10-man practice squads. Additionally, running back Tyler Gaffney likely would have made a 53-man roster, but he suffered a knee injury that will sideline him for the entire 2014 season. The Carolina Panthers, who took Gaffney in the sixth round of the NFL Draft, waived Gaffney with the intention of putting him on injured reserve, only to see the Patriots steal him off waivers and put him on their own injured reserve. Defensive end Ben Gardner, a seventh-round selection of the Dallas Cowboys, injured his shoulder early in training camp and was placed on the Cowboys’ injured reserve. Khalil Wilkes, who participated in San Diego’s training camp, was cut in trimming the roster from 75 to 53 and did not make a practice squad. Along with the new rookies, Johnson Bademosi (Cleveland), Doug Baldwin (Seattle), David DeCastro (Pittsburgh), Jim Dray (Cleveland), Zach Ertz (Philadelphia), Coby Fleener (Indianapolis), Toby Gerhart (Jacksonville), Thomas Keiser (Arizona), Erik Lorig (New Orleans), Andrew Luck (Indianapolis), Jonathan Martin (San Francisco), Chris Owusu (Tampa Bay), Richard Sherman (Seattle), Alex Smith (Cincinnati), Stepfan Taylor (Arizona), Michael Thomas (Miami), Levine Toilolo (Atlanta) and Griff Whalen (Indianapolis) will start the season on an NFL roster. Defensive tackle Matthew Masifilo made Tampa Bay’s practice squad this year after spending parts of two seasons on San Francisco’s and Tampa Bay’s practice squads. Safety Delano Howell, who recorded 19 tackles for the Colts last season, will spend the season on Indianapolis’ injured reserve. Two players that saw action in the NFL last season, Jeremy Stewart and Sione Fua, were cut by Oakland and Denver, respectively, as part of the team’s final roster reduction. In total, former Cardinal players are spread across 16 different teams, including three players on Indianapolis and two each on Cincinnati, Cleveland, Arizona and Seattle. The season-beginning total of 22 Cardinal players in the NFL is up from 2013’s season-beginning total of 20. That number is unlikely to diminish anytime soon, as the average age of all 22 former Stanford players in the NFL is only 24.6. Only one player (Smith, who is 32) is older than 27, and only four players (Smith, Dray, Lorig and Gerhart) have been in the league for more than three seasons. Among universities, Stanford ranks 23rd nationally in terms of the number of former players in the NFL, and fourth in the Pac-12 behind only USC, Oregon and Cal. Contact Michael Peterson at mrpeters ‘at’ stanford.edu.